So why does Jeff Sessions love it? Attorney General Jeff Sessions at the Department of Justice in Washington on Thursday. When he’s making arguments he knows will enrage his critics, Attorney General Jeff Sessions adopts a soft, matter-of-fact tone, as if to suggest it’s obvious he’s being totally reasonable in the face of an immoderate opposition. “With care—gotta be careful—and professionalism, we plan to develop policies to increase forfeitures,” Sessions said on Monday in Minneapolis. Two days later, he signed a directive that will make it easier for law enforcement to seize Americans’ assets, explaining that “it weakens the criminal organizations when you take their money, and it strengthens our law enforcement when we can share it together and use it to further our effort against crime.” In signing the directive, Sessions reversed policies put in place in 2015 by then–Attorney General Eric Holder, which sharply restricted the Justice Department’s participation in the seizure of cash and property by local and state authorities. Sessions’ rhetorical mode—light, unassuming, almost melodic—makes it hard to tell whether he’s being profoundly naïve or profoundly cynical. This is particularly true when he’s singing the praises of a manifestly unjust policy like civil forfeiture, which enables the government to commandeer large sums from people who are suspected of—but have not been charged with—crimes. 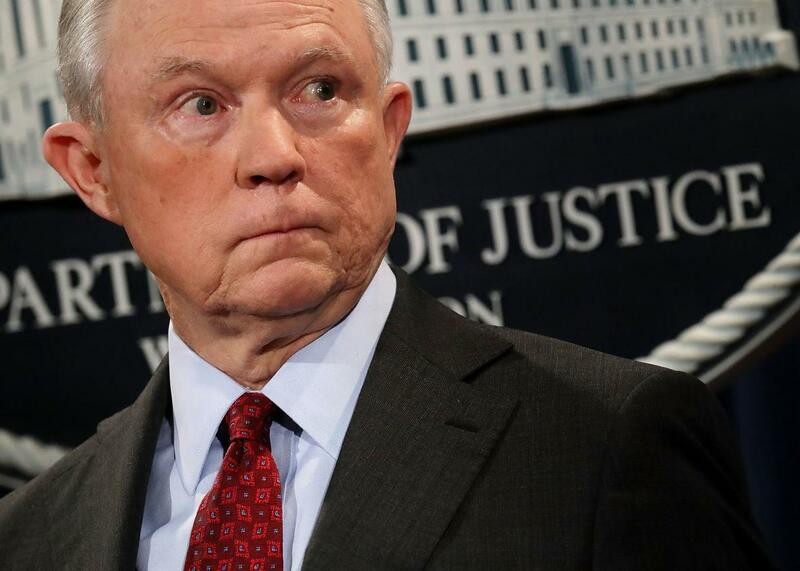 In declaring his warm support for civil forfeiture, the attorney general practically dared his detractors to look into his soul and wonder: Does he think this is a good, fair idea, or is he just pretending because it serves some broader agenda? Described euphemistically as the “equitable sharing” of assets between law enforcement agencies and the federal government, the program Sessions is reviving is widely despised by thinkers and politicians on the left and right who see it as an unacceptable violation of individual rights by the state. Sessions has long been a fan of civil forfeiture, however, and has consistently opposed efforts to restrict the ability of law enforcement agencies to take maximum advantage of it. Ever since the federal government started participating in civil asset forfeiture at the height of the drug war in the 1980s, the argument in favor of the practice has been that criminals shouldn’t be allowed to benefit from money they’ve earned by committing crimes (e.g., selling drugs). Through equitable sharing, local and state police can invite a federal law enforcement agency—usually either the Drug Enforcement Administration or Customs and Border Protection—to take over a case, seize any assets associated with it, and “share” a large portion of the haul (up to 80 percent) with the agency that brought it the case. According to the New Yorker’s Sarah Stillman, proceeds from civil forfeiture soared from $27 million in 1985, a year after the passage of the Comprehensive Crime Control Act, to $4.2 billion in 2012. An investigation by the Washington Post found that between 2001 and 2014, police around the country had seized $2.5 billion in cash from almost 62,000 people without warrants or indictments, all under the federal equitable sharing program. Only a sixth of those seizures were challenged in court, according to the Post, but of the ones that were, a massive 41 percent resulted in the government returning money that had been improperly seized. Key changes include requiring more detail from police agencies about probable cause justifying a seizure before federal authorities get involved. Also, the Justice Department will have to decide more quickly whether to take on local seizures and also let property owners know their rights and the status of their belongings within 45 days of the seizure, faster than federal law requires. Another key change will make it harder for police to seize less than $10,000 unless they have a state warrant, have made an arrest related to the seizure, have taken other contraband, such as drugs, along with the money, or the owner has confessed to a crime. Without at least one of those conditions, authorities will need a federal prosecutor’s approval to seize it under federal law. Even people who generally support asset forfeiture seem to believe Sessions’ safeguards don’t go far enough. Stefan Cassella, a former federal prosecutor who served as deputy chief of the Justice Department’s asset forfeiture and money laundering section from 1989 to 2009, was quoted by the AP as saying that while Holder’s restrictions on equitable sharing went too far, Sessions had only taken “a step in the right direction” in his efforts to prevent abuse. By bringing back to life a program that creates a gross power imbalance between the government and its citizens—a program that, in the words of Supreme Court Justice Clarence Thomas, “has led to egregious and well-chronicled abuses”—Sessions seems to be signaling one of two things. The attorney general either can’t fathom that police departments would ever target innocent people for financial gain, or he just doesn’t care. But the truth might be simpler. Maybe Sessions’ enthusiasm for getting the federal government back into the business of civil forfeiture is just the logical result of a worldview that treats all police officers as righteous agents of order and all suspects as presumptively deserving of punishment. It’s the same worldview that has led Sessions to dismiss painstaking DOJ research into unconstitutional police practices in Chicago as “anecdotal,” to claim marijuana users are by definition not “good people,” to shut down the National Commission on Forensic Science, and to demand that federal prosecutors always seek the most severe prison terms possible when bringing cases. This worldview doesn’t come from naïveté nor cynicism—it comes from Sessions’ apparent belief that the unrestrained and overwhelming exertion of law enforcement power makes a society healthier and more decent. That he expresses this belief in an easygoing lilt makes it sound either disingenuous or innocent. In reality, it is both sincere and sinister.